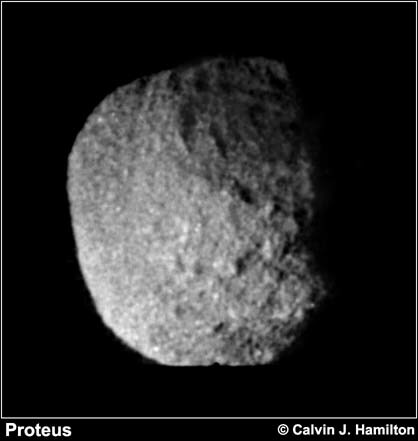 This image of Proteus was acquired by the Voyager 2 spacecraft on August 25, 1989 from a range of 146,000 kilometers (91,000 miles). The resolution is about 1.35 kilometers (.85 miles) per pixel. The satellite, seen here about half illuminated, has an average radius of 200 kilometers (120 miles). It is dark (albedo 6 percent) and spectrally grey. 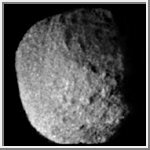 Hints of crater-like forms and groove-like lineations can be discerned. The apparent graininess of the image is caused by the short exposure necessary to avoid significant smear. This image is Copyright © 2001 by Calvin J. Hamilton. Any commercial/for-profit use of this image needs to be addressed to the Author.